One of the hottest genres on the rise during the last year in the mobile games industry - aside from battle royale - is interactive narrative-based games. Success of hit, top grossing games like Pocket Gems’ Episode and Pixelberry’s Choices has clearly caught the attention of publishers. So much so that Pocket Gems itself was able to raise a further $90 million from Tencent in 2017 (the studio also has other titles such as War Dragons and another in-development game), while Nexon acquired PIxelberry back in November 2017. Outside of these two heavyweights in the space though and you’ll see Ubisoft acquiring Is It Love? Series developer 1492 Studio, with Ludia and Nanobit are also making inroads in the space. Catching up with Pocket Gems’ head of studio for Episode Michael Dawson during GDC, he says the studio is not worried about new rivals. “It's going to be hard for anyone to compete with 125 million downloads anytime soon,” he states. “In the same way that Netflix, because their userbase is so large, they can afford to invest more in better content, and more content that then feeds the userbase. It's a virtuous cycle. Pocket Gems is in a position now much like many leaders of new genres - just look at Playerunknown’s Battlegrounds developer PUBG Corp and fast-follower Epic Games with Fortnite's battle royale mode. While other titles have entered the space (including the quick to launch Knives Out for mobile from NetEase), it’ll be tough for too many other studios to experience success in the genre on a similar scale to Pocket Gems. “[Episode] speaks to our history as a company of creating new genres and being the first to establish something new,” says Dawson. One of the reasons for the success of interactive fiction on the app stores is the genre’s wide appeal, particularly to demographics often untapped by other game types. Typically games focus on high stakes narratives such as the end of the world other such highly dramatic, apocalyptic fare - often at the end of a gun. That’s in stark contrast to some of the most popular TV shows out there, be they comedies, soaps or teen dramas. It's going to be hard for anyone to compete with 125 million downloads anytime soon. Episode is home to a variety of stories, be they be they based on licensed IPs such as Pitch Perfect and Pretty Little Liars or one of the many narratives created by users themselves, which helps serve as wide an audience as possible. “If you want to serve an audience similar to Episode you have to understand how to tell stories that appeal to that audience, and that's an audience that I think gaming has - especially interactive fiction in gaming - traditionally underserved,” says Dawson. He states that for a good narrative-based game to succeed, ultimately it has to have a great story at its core. It’s perhaps an obvious statement, but as he puts it, “if the story’s not great, then nothing else matters”. But getting more specific, Dawson says one key aspect to successful interactive fiction titles on mobile is pacing. “On mobile people's session time experience is just shorter,” he explains. “If I think of an intro to a game or intro to a movie, you can do a 20-minute intro before the first act is over. On mobile if your first act doesn't happen in your first session, which is probably five minutes or less, someone's lost. 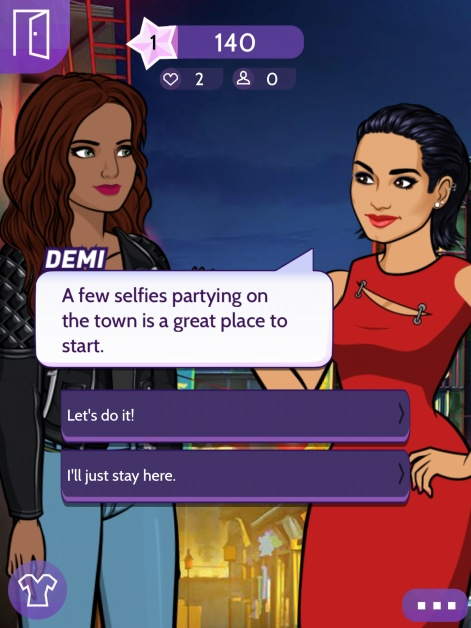 Part of what makes Episode unique is that aforementioned user-generated content. The title is often described as a platform for storytelling rather than ‘just a game’ - in a somewhat similar way that Roblox provides the tools for players to create their own experiences. On mobile if your first act doesn't happen in your first session, someone's lost. With users able to create their own content, there are a myriad of stories for players to access and consume, not just what the team at Pocket Gems is able to churn out. The studio is of course delivering its own content, but it has a community of 10 million people sending them stories too. To date it’s nearly published 100,000 user-created stories worldwide on the platform. The most successful of those has over 80 million episodes read. It’s that unique offering combined with getting in on the genre early that Dawson confidently claims can keep the studio, and Episode, ahead of the chasing pack. “I think there's still going to be a tonne of innovation, but I think that there's so much knowledge we have in the company that we can innovate on the shoulders of that,” he says.